$50 Minimum donation per team , more fundrasing accept. A Prize will be given to the team who raises the most money. All proceeds go to The United Way of Muskingum Perry and Morgan Counties. 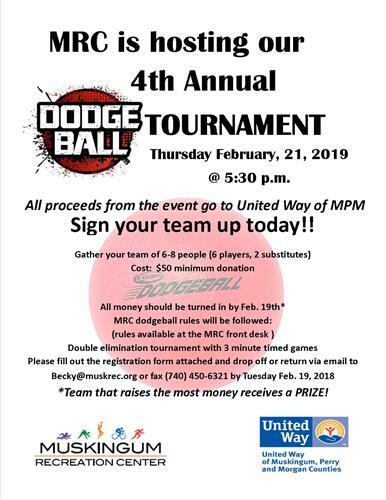 The 4th Annual Muskingum Recreation Center Dodge ball tournament to benefit The United Way of Muskingum, Perry, and Morgan County will be held on Feb. 21 , 2019 . Register today by calling 740-454-4767 or pick up registration forms and information at The Muskingum Recreation Center 1425 Newark Rd.